'Only Yesterday' was shown as one of the films in Film 4's Studio Ghibli Season. 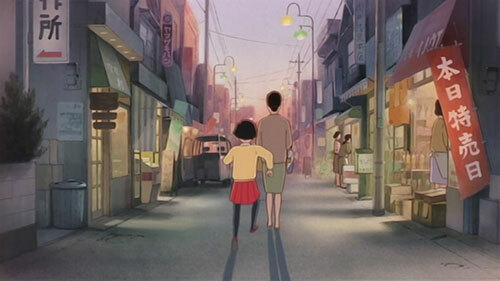 Right from the start of the film it appears to be a break from tradition for the team as the film is based more on normal life than the fantasy worlds or situations that Studio Ghibli are famous for. The film revolves around an office worker from Tokyo called Taeko Okajima, who wants to finally make a second trip to the countryside to pick safflower plants that she had been dreaming of ever since she was a girl. During the trip she reminisces about her school days, and all the trivial things that adults wouldn't think twice about any more. For example, the girls get told that they will start having periods soon whilst in a school assembly, and the boys then start diving at the floor to look up the girls skirts to see if they have their period, or telling one of Taeko's friends not to pick up the ball as they will 'catch her period'. 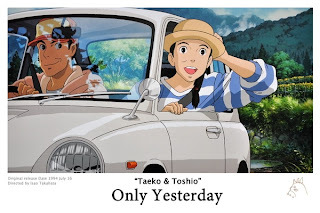 Once in the countryside Taeko begins work on a farm with her friend Toshio, who has worked on a farm for a large amount of his life, and the other woman who pick the safflower plants. This setting looks very peaceful, and is very well animated as some of the scenes show an amazing amount of detail on all of the greenery. All of the flashbacks actually feel older, as the palette used seems to be paler than the modern parts of the story, giving the feeling that the memories are possibly a little cloudy in Taeko's mind. The story is very easy to follow, and as such is a film that can be put on at any time of day and enjoyed. The flashback sequences may take up a large part of the film, but they do not detract anything from the storyline (which has been the case in a few other films) and are implemented incredibly well. All in all, it may not be one of Studio Ghibli's best and most enjoyable films, but it is a very good film none-the-less, and shows a slice of the Japanese lifestyle, something that Otaku's love.